UFOs: What’s 60 Years Accomplished? Mad Cow Disease and Cattle Mutilations? Dinosaurs, those exotic reptilian creatures that ruled the earth (and drive-in theaters) for 300 million years, continue to mesmerize generations of earthbound kids. And count me among them for I was hooked tooth and claw from the beginning. 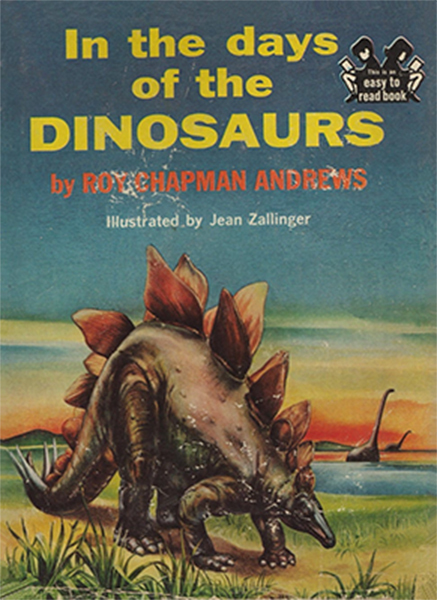 While in third-grade I remember reading Roy Chapman Andrews’ account of his harrowing fossil-hunting trip to the Flaming Cliffs of Mongolia in the 1920s, where he discovered protoceratops nests and the first unearthed dinosaur eggs. And I also remember watching Ray Harryhausen’s animated dino movies at the Saturday afternoon matinee, including: The Animal World, One Million Years B.C. and The Valley of Gwang. And later, I devoured Turok, Son of Stone comics featuring a Native-American duo wandering in a lost valley of dinosaurs and “demons.” As an eight-year old in 1965, the Danish low-budget sci-fi classic Reptilicus was probably my first exposure to the concept that a dinosaur could exist in modern times. As a direct result of my early interest in sauropods, I’ve been scanning the news ever since for emerging scientific discoveries and new archaeological sites of these extinct reptoids. And I’ve also become an avid “bone hunter”/fossil collector. Like many of you, I love the thrill of discovery and for me fossil hunting is both a science and a sublime meditation. Hunting the Upper Jurrasic/Morrison Formation (in that unique slice on the southern side of Utah’s San Rafael Swell) is a must adventure for the truly discriminating fossil collector. 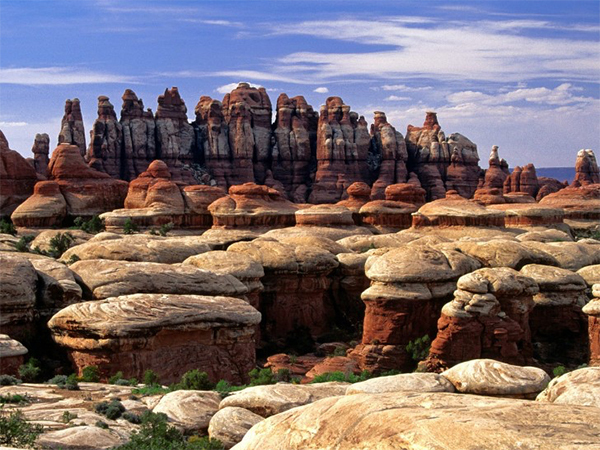 This region is near a remote section of Canyonlands National Monument (where strange dinosaurian creatures were reported October, 2011), and where the world’s only gem-quality vertebra (dinosaur) fossils are to be found. Rarer than meteorites, these gorgeous jasper agate works of art are held as awesome specimens in private collections, but most often seen as polished out pieces innocently adorning rings, beads and bolo ties. And if you decide to go “bone hunting” explorers, pack your water and snake bite kits, for this is an unforgiving, otherworldly landscape. So, what did happen to the dinosaurs? If you are a creationist, they only disappeared a few thousand years ago because they weren’t invited aboard Noah’s ark. The more rational view is that they became extinct around 65 millions of years ago and modern science has ascertained the most likely reason for their demise was the cataclysmic Chickxulub asteroid. 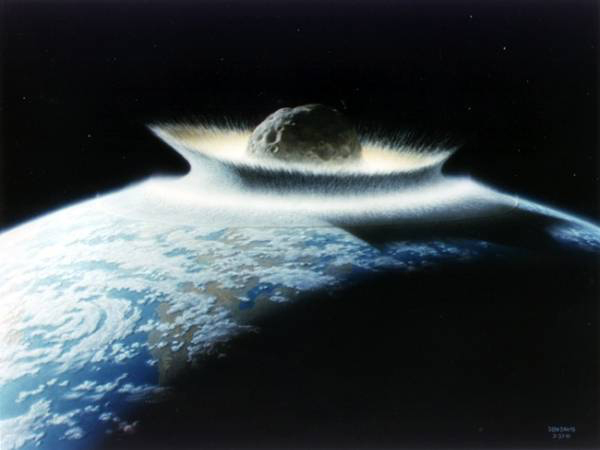 In 1980, Nobel-prize winner physicist Luis Alverez and his geologist son Walter devised a theory that has become widely accepted by mainstream academia: dinosaurs and most mege-fauna were rendered extinct by the Chickxulub asteroid impact in the southwestern Gulf of Mexico at the end of the Cretaceous period, about 65.5 million years ago (+-30,000 years). We now know that a massive six-mile wide object slammed into the planet at this location and the resulting event created a dust and smoke cloud that suffocated the entire planet’s dry land eco-system and killed off most animal species. By analyzing geologic strata data, scientists have identified the thin layer of iridium that was deposited worldwide during this time-period. Iridium is rare on earth but abundant in asteroids, and this evidence suggests that an asteroid impact created hellish conditions that circled around the surface of the planet for months—possibly years. Around 50% of all animal species on the planet — including all remaining species of dinosaurs, pterosaurs (flying species), large marine species like the plesiosaurs and most other small land and sea dwelling sauroid types quickly died out. Evolutionary theory suggests that smaller proto-mammals were somehow able to fill the ecological niche and life continued. Bio-diversity again reigned supreme and the earth recovered from the catastrophic ending of the reigning Mesozoic era with mammals the predominate animal species. We know that mammals flourished after Chickxulub, but is it possible that some species of dinosaurs somehow managed to survive as well? Recent scientific findings suggest a few dinosaur species are known to have survived up to 700,000 years after the epic impact. Some of these types may have evolved into today’s birds, but what about persistent sightings and apparent trace evidence of larger sauropods? The search must begin in pre-historic times. Since ancient times, stories of dinosaurs, dragons and other large reptoidal forms have been documented in the myths and legends of humans. Ancient dinosaurian descriptions from the East are found in Sumer, Babylon, Egypt and other ancient Near-Eastern cultures and in Far-Eastern Asian countries—most notably: China. 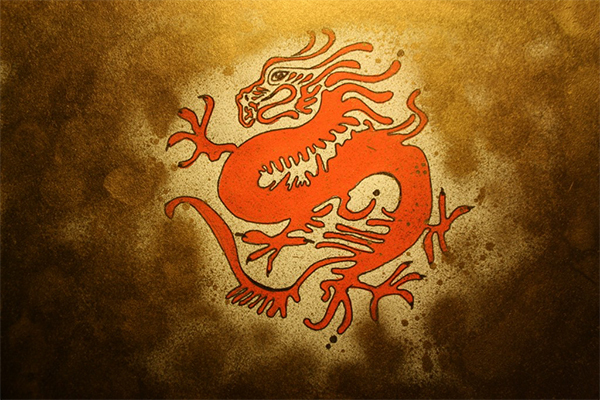 When and where the dragon archetype emerged in Chinese Culture is lost in prehistory. Dragon (or reptilian) references have been found as far back as 4700 BC, as depicted on jewelry from the pre-Chinese Hongshan culture and even earlier at Neolithic Xinglongwa cultural sites. In Asia, dragons are thought to be positive creatures, often depicted as ruling bodies of water, streams and rivers and there are over 100 dragon names found in classic Chinese texts. Ancient Chinese legends mention that the legendary first emperor, Huangdi had been immortalized into a emblematic dragon form and that he ascended into the heavens. This may be where the concept of the Chinese emperor’s Dragon throne originated and also may be why some Chinese have referred to themselves as the descendants of the dragon. As you head west from China, we see a gradual blending of the dragon form with a more snake-like form of the naga. These are sacred snake-like creatures in Tibet, and like the Chinese dragons, they rule over bodies of water and often are said to live underground where they sometimes guard treasure. There are many other mythical reptilian forms found throughout Southeast Asia, but they are predominantly thought of in a positive light. Cut to the final act: After the murder of her husband by Marduk, Tiamat spawned an army of dragons, horned serpents and chimaeric humans creatures and attacked Marduk, but for naught. After the conflict in which Tiamat was slain and mutilated, Marduk cut her body into pieces. (Kind of a reverse Isis and Osirus story, of sorts.) There are many other amazing myths and legends that hint at reptoidal creatures throughout the ancient world that are too numerous to mention in this article. While we are on the subject of dragons, they are found in Greek mythology as well as in documented historical accounts from ancient to medieval times. In his memoirs, Alexander the Great mentioned a dragon over 100 feet long that his soldiers witnessed while campaigning in India. The hissing creature was described as living in a cave and was not friendly. Begged by nearby villagers not to harm it, Alexander obliged. He also wrote that his soldiers, while on campaign, were so terrified of [all] the dragons encountered that they left them alone and didn’t attempt to arouse their anger. As we examine the myths and legends of ancient Greeks and Hittites we find other references that tell of humans and gods fighting dragons and other large reptile forms. The myths include: Perseus and Andromeda, Bellerphone and the Chimaera and the Hittite storm god Tarhun and the dragon Illuyankas. 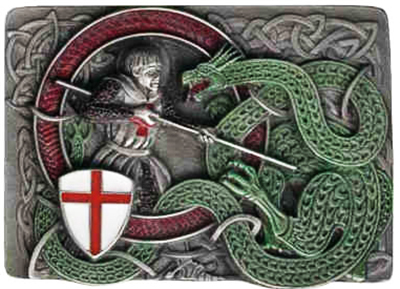 A distillation of these myths can be found much later in the famous medieval story of St. George slaying the Dragon. This allegedly occurred near the Libyan town Silene. George is said to have saved the princess daughter of Selinus, who was about to be offered as a sacrificial offering to a dragon that had become dissatisfied with sacrificial children offered by the townspeople. .
immortalized down through the centuries and may be a more recent version of other ancient legends. Throughout the ancient and medieval world there is tantalizing evidence of dragon and dinosaurian beasts influencing art and culture. Roman mosaics features dragon motifs, Viking ships were often adorned with dragon headed bows—said to scare away sea-monsters. Reptilian forms depicted in the art and myths of ancient peoples are found around the globe. But myths and legends are one thng, what about actual documentation? According to Axon article, the dried carcass measured 39 feet long and featured plate-like armor on its large belly and legs, which were short and adorned with nasty-looking claws. Evidently, the beast was formidable for “…the back [is] protected by a still thicker and double cuirass, starting from behind the ears of the anterior head, and continuing to the tail.” It had a long neck and flattened canine like heads. That’s right, the monster preserved in the town of Asuncion was quite the sensation for it featured two heads. 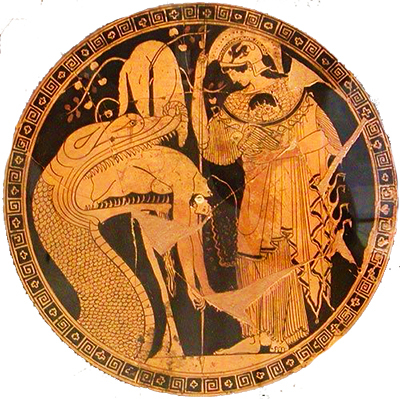 Perhaps this discovery could help explain ancient cultural belief in the mythical “hydra,” “medusa” or other multi-headed reptilian forms found in many cultures myths and legends? Whether modern science like it or not, dinosaur-like creatures are being reported worldwide today and perhaps some of the most intriguing accounts are found in the remote swamps in the Likoula region of the Congo, in west-central Africa. 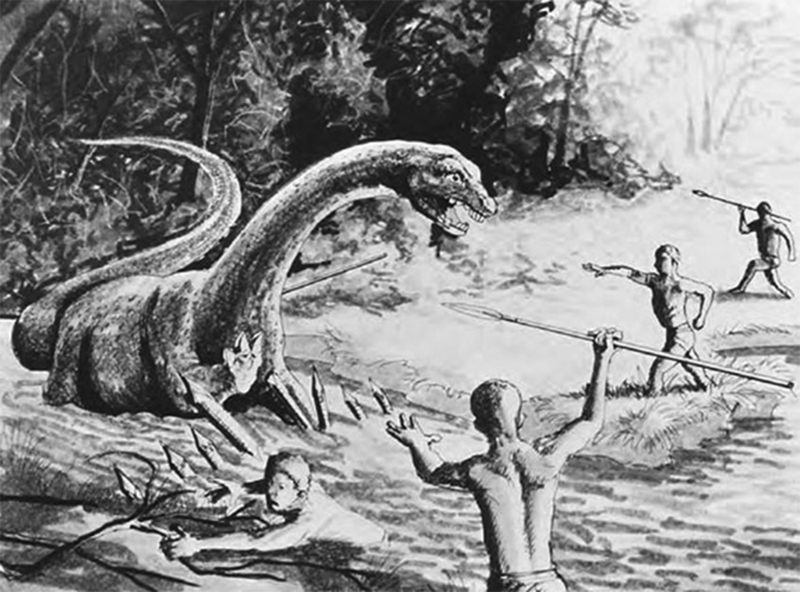 Natives in the region –for hundreds of years– have encountered the water-loving mokele-mbembe, a local Lingala term for “one who stops the flow of rivers.” Described by witnesses to be sauropod-like with a small head atop a long slender neck, like its Amazonian cousin, it sports a long whip-like tail, thick tapered body with thick legs that leave distinctive footprints. It leaves trace evidence that has allegedly reported for hundreds of years. 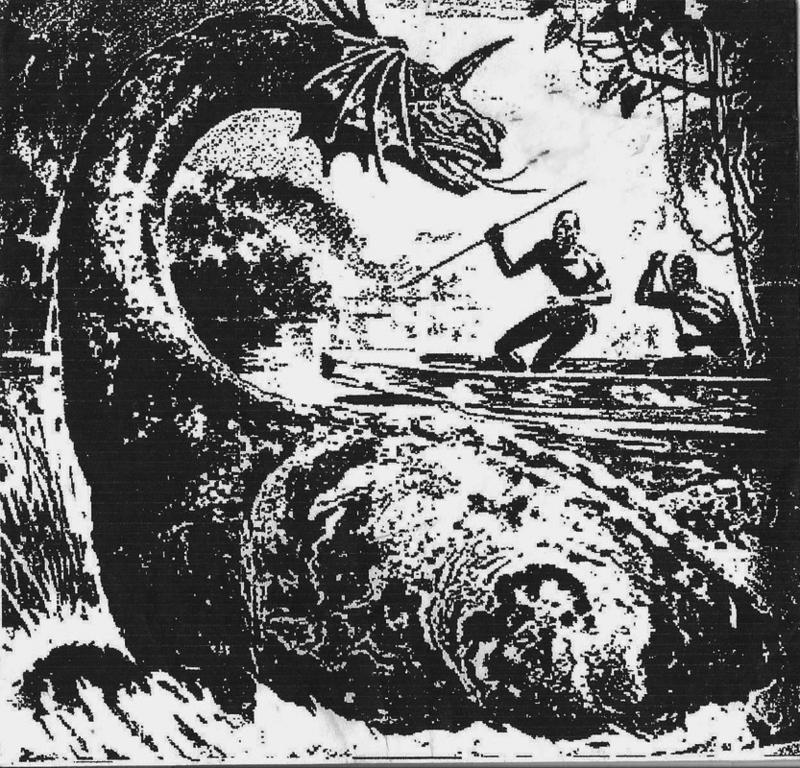 Wider West-African cultural legends of this beast have also morphed into paranormal versions that are reminiscent of “Nessie,” Scotland’s Loch Ness Monster, but for generations, the region has consistently produced descriptive sighting reports by natives, explorers, missionaries and government officials living in this timeless region unchanged for millions of years. And these sighting claims continue in the modern age. 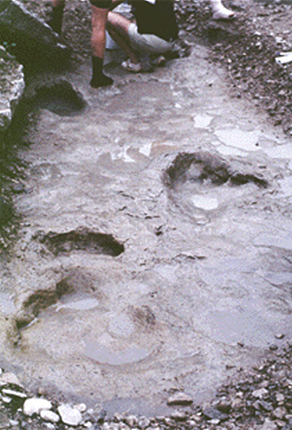 While crocodile hunting in the area in the late 1970s, Roy Mackal, a University of Chicago biologist, heard mokele-mbebe stories and was intrigued by a documented chain of claims that went back to French missionary accounts of finding “huge, plate-shaped tracks” in 1776. Mackal was impressed enough to mount two expeditions to the area in 1980 & 1981. A possible sighting event on a river occurred during the second expedition, as noted in Jerome Clark’s 1993 book, Unexplained and the two expeditions are described in Mackal’s 1987 book, A Living Dinosaur. Predictably, Hollywood has also taken notice of mokele-mbembe and other fabled African crypto-dinos – referred to by various West-African tribes as: “Nsanga,” “Jago-nini,” “Amali,” “Coye ya menia,” and Emela-ntouka,” among others. Since 2006, National Geographic Channel has mounted two expeditions to the region; History Channel’s MonsterQuest and the Sy-Fy Channel show Destination Truth have also ventured into the forbidding Congo swamps in search of these elusive modern dinosaurs– all with limited, if any conclusive results. Several intriguing photographs have been taken over the years, but no hard evidence for these elusive beasts’ existence has been produced and the jury of science is still out. Like bigfoot, mokele-mbembe (and his various African cousins) continue to remain an unsolved cryptozoological mystery. Cameroon also has a reputation for harboring undiscovered mega-fauna that certainly seem saurian in their description. Although legends and stories have become entrenched in the local native societies, it wasn’t until the late-nineteenth & early twentieth-century that the western explorers to the region first heard tales and saw evidence of these creatures existence. 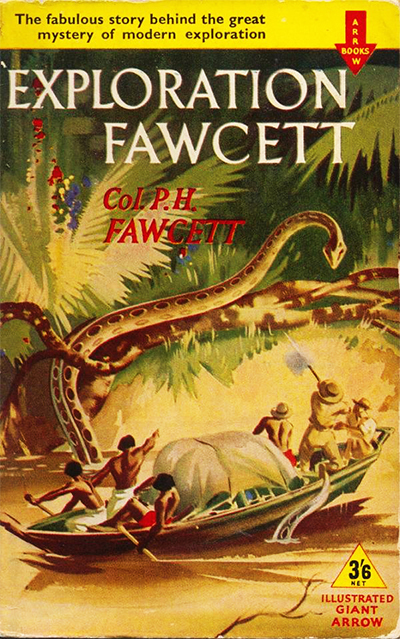 In 1913 the German government financed the Von Stein expedition to explore and map the Cameroon and Captain Von Stein later wrote of an animal larger than a hippo and almost elephant-sized with a long flexible neck and tail that was said to have created a massive trail through the jungle that the expedition encountered. Up river from the site, Sanderson and his party later found huge unidentified tracks that could not have come from river-dwelling hippopotami the only animal large enough to create the tracks. According to local natives, hippos were no longer found in the area as they had been killed or forced out by the “m’kuoo m’bemboo[s],” (as phonetically spelled by Sanderson). Interest in the Cameroon crypto-dinos has endured down through the decades: in 2009 the History Channel sent the crew of the popular TV program MonsterQuest to the Cameroon-Congo border area where recent sightings have been reported. They interviewed eye-witnesses who claimed encounters with real-life sauropod-like dinosaurs, and explorer William Gibbons,who helped investigate the cases found one witness who said we was able to reproduce the distinctive call of the beast that he and others had reported. Gibbons surmises that the animal has a bullfrog-like air sac that produces the loud resonating call that is perfect for ending reality-show TV segments and scaring the natives for generations. The Amazon Basin is one of the planet’s most remote and inaccessible regions. Covering three million square miles, this largely unexplored area was the setting for Sir Arthur Conan Doyle’s 1912 fictional novel The Lost World and if living dinosaurs still exist, this would be one logical place they could exist without detection. “[A] head appeared over bushes 10 feet tall. It was about the size of a beer keg and was shaped like that of a tapir, as if the snout was used for pulling things or taking hold of them. The eyes were small and dull and set in like those of an alligator. Despite the half dried mud we could see that the neck, which was very snakelike, only thicker in proportion, was rough knotted like an alligator’s side rather than his back. “Evidently the animal saw nothing odd in us, if he noticed us, and advanced till he was no more than 150 feet away. We could see part of the body, which I should judge to have been eight or nine feet thick at the shoulders, if that word may be used, since there were no fore legs, only some great heavy clawed flippers. The surface was like that of the neck…. “As far as I was concerned, I would have waited a little longer, but Pfleng threw up his rifle and let drive at the head. I am sure that he struck between the eyes and that the bullet must have struck something bony, horny or very tough, for it cut twigs from a tree higher up and further on after it glanced. I shot as Pfleng shot again and aimed for the base of the neck. West New Britain is an extremely remote, sparsely populated province of Papua New Guinea and stories have emerged from native populations that mention huge sauropods that live along the coastal areas of unpopulated Dililo Island. In 2008 explorer Brian Irwin collected stories that mention sightings of this great creature had taken place in 2006 and his account was published in forteanzoology.blogspot. com. Sauropod dinosaurs are not the only possible type of living dinosaur reported in New Guinea. The famous flying “Ropen” have been reported for years and have been the subject of several recent high-profile television programs on National Geographic, Discovery and History Channels. Thought to be “grave robbers,” these giant flying reptiles are reminiscent of pterosaurs and according to several reports they are self-illuminated at night and have a bioluminescent glow! Flying pterosaur-type dinosaurs have been observed worldwide and are probably the most often reported type of dinosaur sighting. Along with dozens of lake monster reports, unfortunately, there are far too many reports of these creatures to cover in this brief article. While in Utah this past October I was surprised to learn of two separate sightings of small dinosaurs in Canyonlands National Monument. Both claims came from a remote part of the park and were related to several residents of Moab, UT. 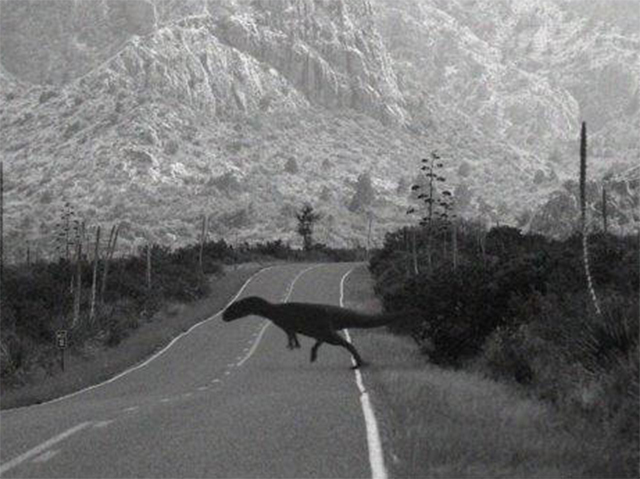 For years locals (and the occasional visitor) have mentioned small fast, three to 4 foot tall dinosaurs that resemble “miniature T-Rexs.” Newspaper and television news accounts of these creature sightings have been published in several Four Corner area publications and aired on local news broadcasts–including this 2002 report on KSL-TV News in Cortez, Colorado. “’It was a Jurassic Park flashback. I mean I was — I couldn’t believe it,’ says Shannon Ystesund. Ystesund and a girlfriend were driving down this road the night of July 5. She says a creature ran in front of the headlights, a very big lizard, nearly vertical, running on its hind legs. ’We were, you know, freaked out. Immediately we thought it was some kind of dinosaur or a huge lizard. So we came home,” she says. ’They just walked in and they were real excited and they said, ‘we just saw a little dinosaur run across the road,'” says Ystesund’s husband, Keith. ’Looked like the little dinosaurs in Jurassic Park that surrounded everybody in the tall grass fields,” says Shannon. According to New Mexico cryptozoologist/river guide J.C. Johnson, and MN private investigator Nick Sucik have investigated reports of these small, fast dinosaurs that are surprisingly widespread around the San Juan River Basin and the Northeastern part of Lake Powell. The Lake Powell and San Juan reports have given rise to the nickname, “river dinos,” and there are even reports of the dinos moving in groups of up to a dozen animals. Johnson has also has investigated dino sighting reports on the Navajo Indian Reservation and has witnessed “giant snakes” in the San Juan River. It seems the magical Four-corners’ region contains mysteries that refuse to go away. 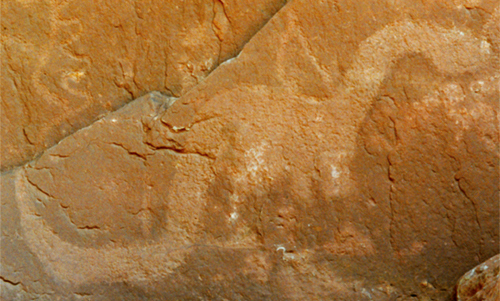 Further west, in the Grand Canyon, there are petroglyphs that look amazingly like sauropods and suggest that ancient man may have witnessed these rare and elusive creatures. Could these animals have somehow survived in the high, dry Colorado Plateau region for millions of years? Scientists scoff at the notion, but reports continue to be logged by surprised witnesses as they observe these “mini T-Rexs” scurrying across roads and along the riverbanks of the Four-Corners region and in the remote jungles of the world. 3 Responses to Modern Dinos? Thank you for your well-researched article, and that you have addressed a very controversial topic which I believe deserves much more serious attention than most people (especially the so-called experts regarding the history of our planet)are willing to give it. Hey Chris..great article. 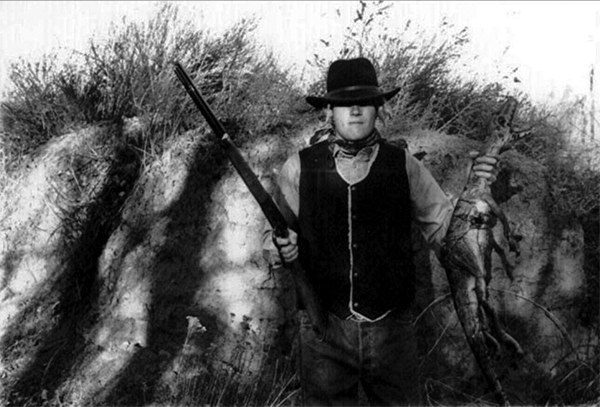 I was raised on the San Juan river…near Waterflow,nm. The area near hogback mountain is very strange. We used to haul and dump out trash on the west side of hogback…on the Rez side. A lot of stray dogs in the area…we used to hunt rabbit there also. There are many caves in the area…with a lot of bones. We seen something over a ridge about a mile up the dirt road. The road goes all the way towards Cortez…rugged. Whatever it was would hide a good distance away…hunkering down. The dump was used by all natives to dump their trash…the entrance point is now fenced off…my father assumed that perhaps it was homeless people living down in there feeding off the dump. I don’t know if that is what it was. There was a time we took the truck back about 5 miles…went past several summer sheep camps…and then we came over a hill and in the distance was three black trucks with camper shells. About five or six white men with guns on their hips. They stared over at us…my dad said to get down as we were in the back of the truck hanging on the livestock cage…one man reach for his gun and motioned over to us. My dad by this point was doing a u turn as we came over the hill where it was flat….they were approx 1000 ft away. White people were never back in this area…never. If wasnt Halliburton bc their pickups were always white. We left the area immediately…I don’t think we ever ventured back up in there again. My dad said they looked military. A year or so before that incident we saw lights on top of hogback for two nights. I baled hay in the summers and never saw that before. But my girlfriend lived right against the mountain and heard weird noises coming from the north. Later that summer 1984 helicopters placed these black boxes on top the mountain…three of them equally spaced on the top of hogback. My gf father inquired what they were and was eventually told after repeated attempts that they were cougar traps. They looked like portable outhouses. My relatives worked at a nearby business and one of the workers came to visit. They advised that they had seen a BF like creature down by hogback on the San Juan river. Navajos usually frequented the turquoise bar and I heard stores they saw skinwalkers while on the river bottom. Just wanted you to know this. So did they not have color cameras in Moab UT in 2002? I mean they’re all like; OH MY GOD A DINOSAUR! LETS GET OUT THE GRAINY BLACK & WHITE CAMERA RIGHT AWAY! We are clearing up some technical details and hope to have this going very soon! 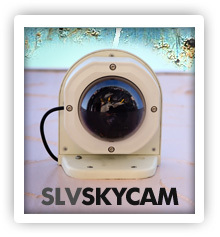 The SLV Camera Project and Our Strange Planet requests your help! The first of seven cameras is operational, but we need more bandwidth and additional gear, and that costs money. Any donation you can contribute will be greatly appreciated. Thank you in advance. Contributors of $100 or more will be thanked with a personally-signed copy of your choice of my latest two books. And thank you again for your kind support! BestJason on The NORAD Event and The Gallop Incident: Was There a Connection?